In an effort to further differentiate their high-end products, luxury watchmakers are continuing to move farther away from precious metals and jewels, and focusing more on wacky novelty features. 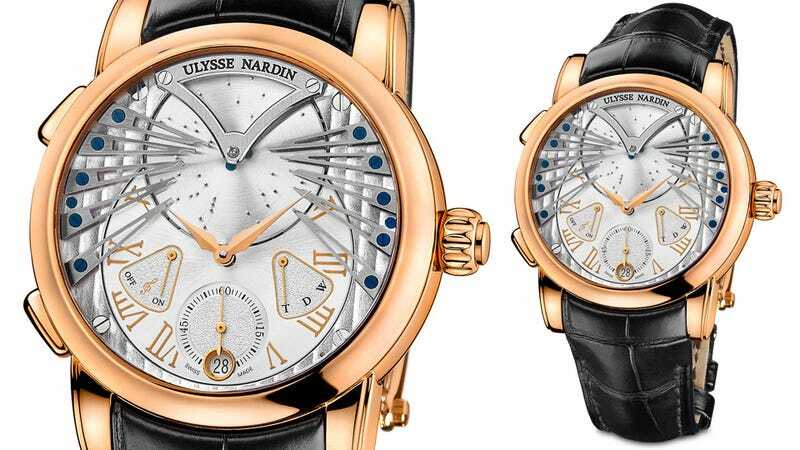 So instead of just chiming at the top of every hour, Ulysse Nardin's Stranger watch plays Frank Sinatra's 1966 hit Strangers In the Night on a tiny spinning music box. If you can't wait to show off your investment, the watch can also play the tune on demand. And it's of course still made from such luxurious amenities as 18 carat rose gold, a genuine leather band, and an assortment of embellishing jewels. Only 99 of the Strangers are being made, which roughly translates to: if you think you can afford this, you're probably kidding yourself.